In this image from 2012, CNEWA’s president Msgr. John E. Kozar visits St. Anthony’s Dayssadan in India, a home for children with physical disabilities run by the Preshitharam Sisters. On 11 March 1926, Pope Pius XI decided to unite permanently into one organization and under one administration all the American Catholic associations working for assistance to Russia and other areas of the Near East and in general working for the same goals as the Sacred Congregation for the Oriental Church and the Pontifical Commission for Russia. This new pontifical organization was to be called the “Catholic Near East Welfare Association” (CNEWA). It was placed under the immediate direction of the archbishop of New York, and he was invited to form a governing body selected from the American hierarchy. The funds raised by the new association were to be placed directly at the disposition of the Holy Father, who would disburse them in response to the requests for assistance coming to him from all over the world or recommended to him by CNEWA itself. It has been a remarkable 90 years, and a time worth remembering with humble gratitude and joy. Over the next several months, in our magazine and here on the blog, we'll be taking note of this milestone in a variety of ways. Beginning today, we launch a special series, “90 Years / 90 Heroes,” saluting just a few of the ordinary people who have done extraordinary work on behalf of CNEWA — and, as a result, on behalf of the poor and suffering throughout our world. During this Year of Mercy, we feel especially privileged to have been messengers of mercy to the poor, the hungry, the persecuted and the marginalized. And we owe a profound debt of gratitude to countless donors and benefactors who have helped us carry out our mission. A blessed and happy anniversary to all who are part of our CNEWA family — and be assured of our continued prayers! The Rev. Paul Wattson, S.A.
Over the next several months, as CNEWA marks its 90th anniversary, we’ll be spotlighting 90 people who made a profound difference in our world over these last 90 years — and it’s only fitting that we begin at the beginning. The first of our “90 Years, 90 Heroes” profiles features CNEWA’s co-founder, the Rev. Paul Wattson, who also founded the Franciscan Friars of the Atonement. Father Paul died in 1940; this past fall, the Archdiocese of New York formally opened his cause for canonization. Father Paul regarded other churches not as heretics and enemies, competitors or targets for proselytization, but as friends and fellow travelers on the road to the unity Christ wished for his church. He saw it as his task to be the Lamp that helped them on this journey. His attitude toward other churches and his concern for the poor brought Father Paul in increasing contact with the Christians of the Middle East and India. After World War I, the situation of Christians in the Middle East was dire. Genocide was the order of the day for Christians in the lands of the Middle East. Millions of Armenians and hundreds of thousands of Christians from other Orthodox and Eastern Catholic churches were either slaughtered or driven out of their homes as refugees. Father Paul and the Rev. George Calvassy (later a bishop) of the Greek Byzantine Catholic Church sought a way to alleviate the sufferings of all Christians in the Middle East. Their attempts took many different routes, some of them dead ends, but their efforts along with others resulted ultimately in the founding of Catholic Near East Welfare Association (CNEWA) in 1926. Pope Pius XI formally recognized CNEWA as a pontifical organization and placed it under the direction of the archbishop of New York. The Eastern churches — Catholic and Orthodox — were dear to the heart of Father Paul. Many bishops from these churches visited Father Paul at Graymoor to ask his help and express their gratitude for any assistance they received. Father Paul died on 8 February 1940. His pioneering work for Christian unity today might be considered ahead of its time, and even prophetic. He did not live to see the Second Vatican Council and its decree on Christian Unity; he did not see the Week of Prayer for Christian Unity become a world-wide event promulgated by both the Vatican and the World Council of Churches. But his prayers, vision and passion laid the groundwork for vastly improved relations between Catholics and Orthodox Christians, and helped CNEWA become a significant force for humanitarian and pastoral aid in a Middle East — a troubled land that is once again in our own day a place of genocide and exile. Read more about Father Paul here. And for the full history of CNEWA, check out this link. As we mark CNEWA’s 90th anniversary today, we are continually uplifted by the faith and joy of those we have met from around the world, especially the young people. Here are a few small glimmers of hope: young Syrian refugees at the Zahle camp in Lebanon in January of 2016. Today marks a significant and tragic anniversary for the Ukrainian Greek Catholic Church. Seventy years ago today, 10 March 1946, the church was brutally liquidated by Stalin’s regime, when the territories of western Ukraine fell under Soviet rule. The liquidation campaign was orchestrated by the Communist regime as a process of reunification of the Ukrainian Greek Catholic Church with the Russian Orthodox Church. A special “synod” was held at St. George’s Cathedral in Lviv; about 200 local Ukrainian Greek Catholic priests were coerced to participate. The synod did not have any ecclesiastical legal validity since none of the Ukrainian Catholic hierarchs took part in it; by then, most of them were either under arrest or already in concentration camps. But at this meeting, it was decided that the Ukrainian Greek Catholic Church would break its ties with the Holy See and that it would be absorbed by the Russian Orthodox Church. From that point, all clergy and religious who refused were subject to persecution by state authorities. All Ukrainian Greek Catholic bishops, along with most of the priests and religious, suffered harsh oppression by the authorities for not giving up their Catholic identity and for staying loyal to their faith and the pope. As a result, from 1946 till 1989, the Ukrainian Greek Catholic Church — numbering about 2,000 clergy and several million members — was forced underground. Among the priests who stood up to the regime and refused to acknowledge the validity of the synod’s decisions was my late grandfather, Adam M. Morawski. Despite numerous threats to his life from the communist regime, he continued to minister to his flock as a Catholic priest. In 1949, he and his family were arrested and deported to a labor camp in Krasnoyarsk region in Siberia. After nine years in labor camps, they were allowed to leave Siberia. Father Adam continued to minister secretly as an underground Catholic priest in Soviet Ukraine for the rest of his life. He died in 1982, several years before the church was legalized with the collapse of the Soviet Union. I admire him for his principles, strong faith and his loyalty to the church. This sad anniversary is a strong reminder that throughout history Catholic Eastern churches have paid a very high price for their Catholic identity — and that they are a great gift to the universal church. 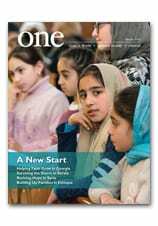 To learn more about how Ukraine’s church is being revived today, read Out from Underground in the Autumn 2015 edition of ONE. And to support Catholics in Ukraine as they work to rebuild their church, visit this giving page. The UGCC has demonstrated with its very blood its solidarity with the Bishop of Rome and the worldwide Catholic communion. Now, during the Year of Mercy, is the time for the Catholic Church to bring the healing balm of mercy to their suffering brothers and sisters in Ukraine in reciprocal solidarity. The Ukrainian people are proving their commitment to European values of human dignity and the rule of law. Now is the time for Europe to understand that if it does not stand up for these same values in Ukraine, they become endangered throughout the continent. This is a time to confirm what the nations of Europe and its religious communities hold most dear; a time to see whether the blessings of freedom and prosperity that Western powers and societies enjoy might be shared more fully with a long-suffering people. The Ukrainian Greek Catholic Church ceaselessly prays for and promotes peace, and in Rome its leadership appealed to the Holy Father and to the world to help stop the war and stem the humanitarian crisis caused by the Russian invasion of Ukraine. For Ukrainians who belong to different Churches and religious organizations and even secular citizens, the Holy Father is a global moral authority who speaks the truth. This voice of truth is particularly important for the suffering people of Ukraine. If the people do not hear or understand this voice they becomes confused, anxious and feel forgotten. “The people are suffering, Holy Father, and they await your embrace, the active support of the Catholic communion and all people of good will” was our word. His Holiness made it clear that he would act. It was most important that on the eve of the sad anniversary of the Pseudo-synod of Lviv Pope Francis wholeheartedly acknowledged the faithfulness and heroic witness of generations of Greek Catholics. He prepared a warm pastoral statement calling the events of March 1946 by their proper name. The Holy Father emphasized that one cannot solve ecumenical problems at the expense of an Eastern Catholic Church. We hope that His Holiness will initiate and support new steps to help relieve the dire hardships endured by millions of Ukrainians, that he will speak out on their behalf and encourage international aid. The UGCC stands ready to facilitate responsible, transparent, ecumenically sound administration of international assistance, serving the Ukrainian population without regard to ethnicity, political or linguistic preferences or religious affiliation. We are ready to cooperate in a well-coordinated plan that includes governmental and non-governmental bodies in order to lift the suffering out of their need, meeting both short-term and enduring needs of those affected by the humanitarian crisis caused by the invasion of Ukraine. Enough of this suffering! It can be prevented. It can be healed. Let us make the “Year of Mercy” a reality for the people of Ukraine. Children receive oxygen at a hospital in Taza, Iraq, on 9 March, after ISIS militants fired mortar shells and rockets filled with “poisonous substances” into their village. A new report states that Christians and minorities in Iraq, Libya and Syria are victims of genocide carried out by ISIS. The report contains dozens of statements collected from 22 February through March 3 from witnesses and victims of atrocities carried out by Islamic State forces. The incidents include torture, rapes, kidnappings, murder, forced conversions, bombings and the destruction of religious property and monuments. It cites statements from religious leaders, including Pope Francis, and conclusions from the European Parliament, the U.S. Commission on International Religious Freedom and the Iraqi and Kurdish governments, all of which have labeled the Islamic State’s actions as genocide.